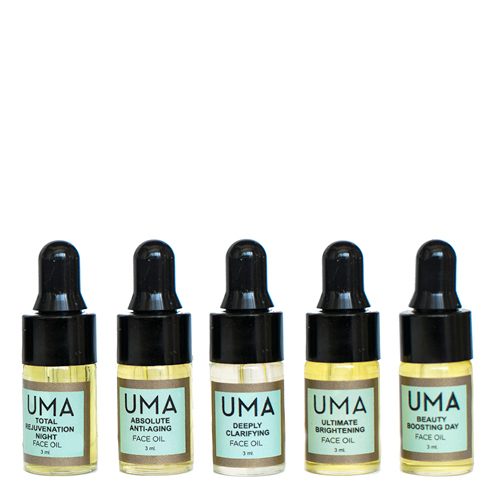 The best way to discover your favorite UMA Face Oil is with the Face Oil Trial Kit. Each 3-ml sample lasts 1-2 weeks so you can get a well-rounded sense for all the benefits the UMA farm-to-bottle face oil blends deliver. This kit includes a wide spectrum of tailored face oils, allowing you to choose your favorite for long term use. Included in the kit are 3 ml bottles of: Absolute Anti-Aging Face Oil, Ultimate Brightening Face Oil, Total Rejuvenation Night Face Oil, Beauty Boosting Day Face Oil and Deeply Clarifying Face Oil. I ordered this sample kit a little over a month ago and I am so happy I did. I had been hearing a ton of hype about UMA in the social media sphere and was very intrigued to try them out. Honestly, this was the most cost effective way for me to learn that the majority of this brand is not for me, aside from the Deeply Clarifying oil. I will be purchasing the deeply clarifying spot treatment, because the deeply clarifying oil seems to be the most effective one out of the bunch.